Photo History Museum FUJIFILM SQUARE Animal Locomotion – An Exhibition of Photos by Eadweard Muybridge | If you love photography, why not visit FUJIFILM SQUARE – photo exhibitions in Roppongi, Tokyo. The Photo History Museum in FUJIFILM SQUARE is pleased to announce the photo exhibition “Animal Locomotion – An Exhibition of Photos by Eadweard Muybridge” which runs from June 1 – September 2, 2013. Eadweard Muybridge was an English photographer who gained prominence for his photographic studies of motion. 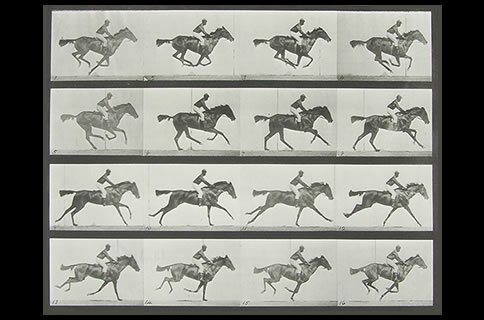 In 1873, Muybridge began a period of chemical research aimed at enhancing photographic sensitivity, and in 1878 was successful in photographing a horse at gallop by placing 12 separate cameras in line along the edge of a running track to prove conclusively that a galloping horse runs with all four feet off the ground when its legs are collected beneath its body as it switches from pulling with its front legs to pushing with the back legs. This groundbreaking study caused a major stir in scientific circles at the time, as it was previously believed that a horse left the ground completely when all four legs were fully extended. Muybridge expanded his photographic studies to include the natural motion of dogs, monkeys, deer, birds in flight and humans. And in 1887, he published his seminal work, Animal Locomotion, which featured a series of stop-action photos of animals in motion. Indeed, it is widely believed that Muybridge’s photo collection acted as the inspiration to Thomas Edison in his involvement in the invention of moving pictures. This photo exhibition features a series of Muybridge’s stop-action original prints selected from Fujifilm’s own photo archives. We look forward to welcoming all photo fans to the Photo History Museum. Eadweard Muybridge was born Edward James Muggeridge in Kingston upon Thames, England. In 1873, he was hired by the former Governor of California and founder of Stanford University, Leland Stanford, to undertake research and experimentation with a view to enhancing photographic sensitivity and to study the motion of moving horses – a widely debated topic of the day. Muybridge placed numerous large glass-plate cameras in a line along the edge of a racetrack; the shutter of each being triggered by a thread as a horse passed, to prove conclusively at which particular point in its motion a horse’s legs were completely off the ground. At the time wet plate photography was the normal practice, however, in 1874, dry plates were introduced marking a major improvement in photographic sensitivity. Muybridge later expanded his photographic studies to include the natural motion of dogs, monkeys, deer, birds in flight and humans, and in 1887, published his seminal work, Animal Locomotion, which featured a series of stop-action photos of animals in motion. His collection was subtitled “An Electro-Photographic Investigation of Connective Phases of Animal Movements” and the publication, which became Muybridge’s most celebrated work, featured a massive portfolio with 781 plates comprising 20,000 photographs.